Pool Sesh - Hat Trick! Fresh from kayaking and sailing, I hopped down to the pool for a little more kayaking. I brought my wetsuit this time and had a try at some of the more tricky balancing feats. I worked on getting from the Bow to the stern without flipping the boat. I tore my wetsuit on one of the deck fittings but I got from the bow to the stern and then flipped the boat over and paddled it upside down. I spent some time with the rest of the group practicing rescues as usual and even conned some of my friends into trying an eskimo rescue. Pretty fun time and it was great seeing some WCPers there too. 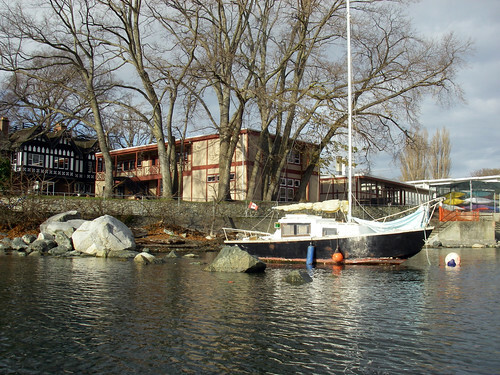 Fresh from my morning trip with Paula, I ran over to Aaron's place and got down to oak bay marina To get out and sail again. I sort of knew what to expect from the winds a bit earlier. We got down to the dock and who should wander by but Katy and her doggie. We all walked down to the boats and Aaron and I set up the cal for a 10 knot wind. We barely had to use the motor at all this time it was just cast off and we were out of the marina. The currents arrested my attention at the marina entrance. The current was tearing around the breakwater in a pretty swift ebb. We got out a little from shore and put the sails up. No motoring necessary today!. We chose a tack and found ourselves actually sailing by the lee. The wind was scooting us along at a nice clip and once we seetled into a rhythm the boat started to go where we pointed it. So just to see what the combined wind and current could give us, we got to 5knots sailing down toward trial. 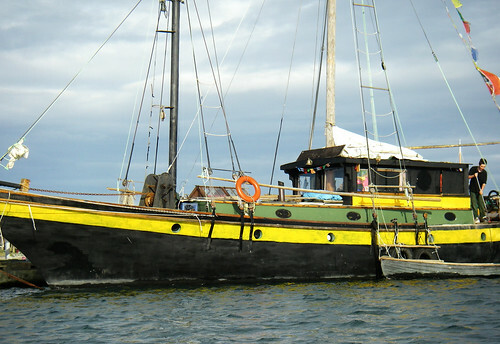 THe boat made and all new sound when we started getting up there. We tacked and did a 360 toward the chain islands, because we didn't want to get too far south in the current. 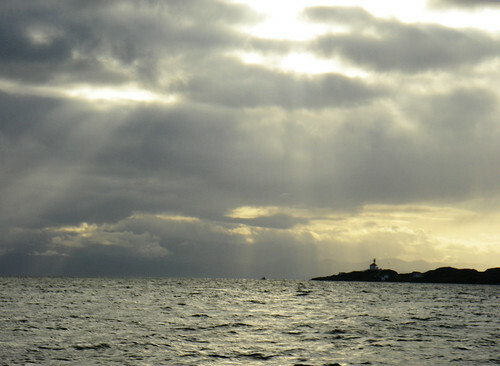 Fighting the current nearly halved our speed and we started creeping ever so slightly closer to the Chain islands. The wind was south westerly and we wanted to head into it to see how close to the wind we could get. Beating down it, it looks like we were able to get about 50 degrees to it. We tired to go a little further up mayor channel, but it was no use, the current was coming through at just under 4 knots and the boat was having none of it. The rest of the cruise was more or less basking in the sunset. 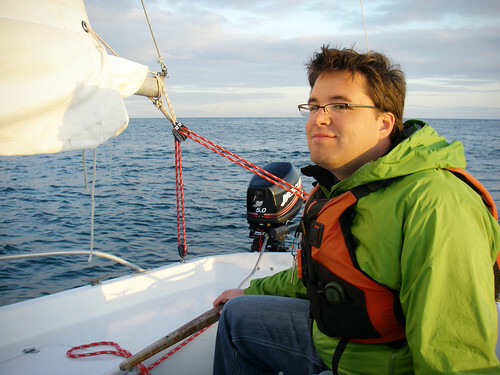 The winds were calming down and had veered a bit more westerly. We were at peak current and had stopped making way toward the marina.. a sailing treadmill. 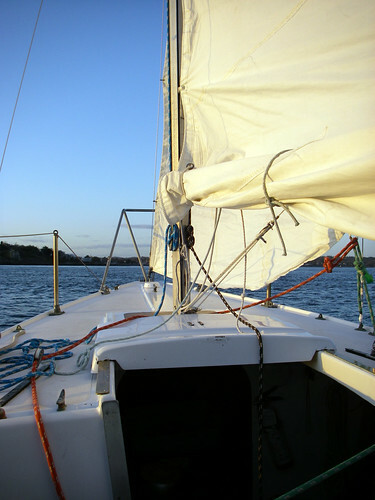 So we just took down the sails and motored in just as the sun was setting for the night. Arron showed me how to unhank and stow a Jib in its bag. a lot easier when you see someone do it. We shook out our reef and headed out for coffee. Paula and I agreed on a short little paddle around Caddy bay at the last minute this morning, so I loaded up the van and headed down to gyro park. There was a nice little breeze coming through the bay and all of the little dinghys were lining the shore with their sails flogging loudly. We pushed off right before them and got well to the side of the bay to stay out of everyone's way. The water was the color of lead and the storm that had come through the day before had left all kinds of swell behind it. Paula and I had a discussion about whether or not the days of print are limited and discussed the finer points of user generated media versus the establishment while cutting through the chop and swell. We gabbed all the way around cattle point and down willows beach until we saw a sailboat in a very un-sailboat friendly place. I couldn't tell if the boat was recently shipwrecked or just junk allowed to float onto the rocks (or both). Still had sails on it! I snapped a few photos for posterity. 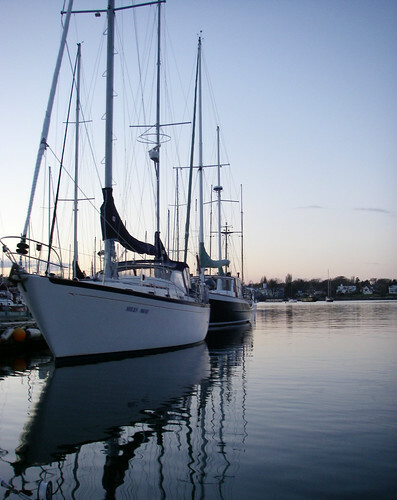 We were getting a bit close to the rocky shoreline, so we headed up through the moorings near oak bay marina and had a look at some of them. About half way through our gawking, the all slowly changed direction with the wind. It's a weird feeling seeing a bunch of large boats all rotating around their moorings. A few people were aboard their boats cleaning the decks and checking everything out including us. We lazily headed back to Cadboro bay and catching the last of the flood around cattle point. 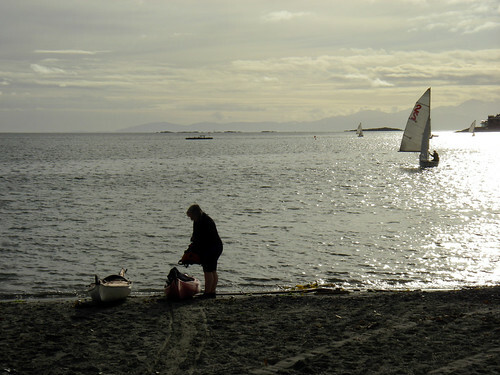 When we got back to shore, all of the little sailing dinghys were doing some training near the beach and a few larger craft were on their way out of the bay.